iMusic has integrated a music library, letting you download songs and playlists from the software directly. It is pretty simple to download songs and playlists with iMusic. Download, install and launch iMusic on your computer. After then, click the “GET MUSIC” menu then “DISCOVER” on the top of the software. You can download music from the built-in library in 2 easy ways. You can find thousands of songs and the hottest playlists from iMusic built-in music library by genres, artists, playlists and top list. a. To download a single song, search it in the search blank then copy the URL below the video, turn to the DOWNLOAD tab. Paste the URL in the blank to start the downloading process. b. To download a playlist, first copy the URL of the playlists. 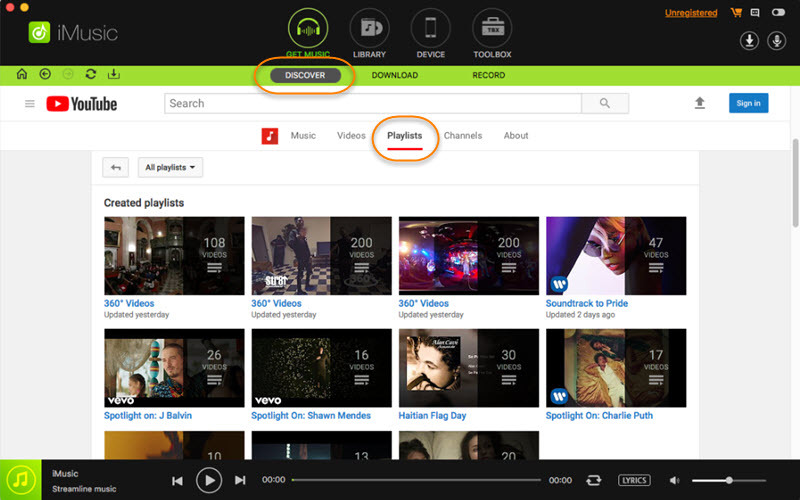 After then, check the wanted songs in the playlist in the pop-up window, choose the format, either “MP3” or “MP4”. Click “Download”. You can check for the downloaded songs in iTunes Library by clicking the download icon in “ITUNES LIBRARY” management window.